Possible upgraded features of the Angara-5M rocket. The first test flight of the Angara-5 rocket in December 2014, marked a major milestone for the long-awaited family of new-generation rockets in Russia, but it also demonstrated serious problems. The Angara-5 launcher was rumored to be prohibitively expensive for commercial users and its payload delivery capabilities turned out to be around 22 tons to the low Earth's orbit instead of the projected 24 tons. There were reports that Angara-5 could not compete in cost and payload with its veteran predecessor -- the Proton rocket, ironically, built by the same manufacturer -- GKNPTs Khrunichev in Moscow. 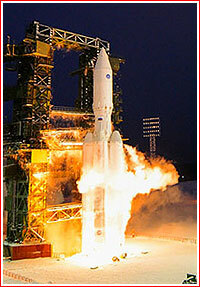 The introduction of the Angara-5 was further complicated by production issues, delaying the rocket's second launch for years. In the meantime, GKNPTs Khrunichev looked at various options to salvage the situation. In 2017, the Russian government promised the introduction of the Angara-5M variant, as a cheaper, modified incarnation of Angara-5. The rocket would be customized for launching unmanned satellites and based in Vostochny. Most importantly, the 5M variant would probably be equipped with modified RD-191M engines on the first and second stages, which are capable of a 10-percent increase in thrust in comparison to the existing RD-191 engines. 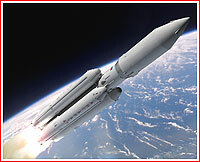 The more powerful engines would enable Angara-5M to deliver up to 27.1 tons of payload into the low Earth orbit. The upgrades to the Angara-5 could also include the introduction of composite materials in the rocket's structure and a new flight control system with domestically built components. 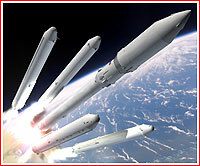 The vehicle's URM rocket modules could also be equipped with backup pneumatic and hydraulic hardware to improve the reliability and safety of the propellant supply system. As of 2017, Angara-5M was promised to make its first flight from a brand-new launch pad in Vostochny in 2021. Most of the improvements of the Angara-5M variant will then migrate to the more powerful Angara-5V vehicle. 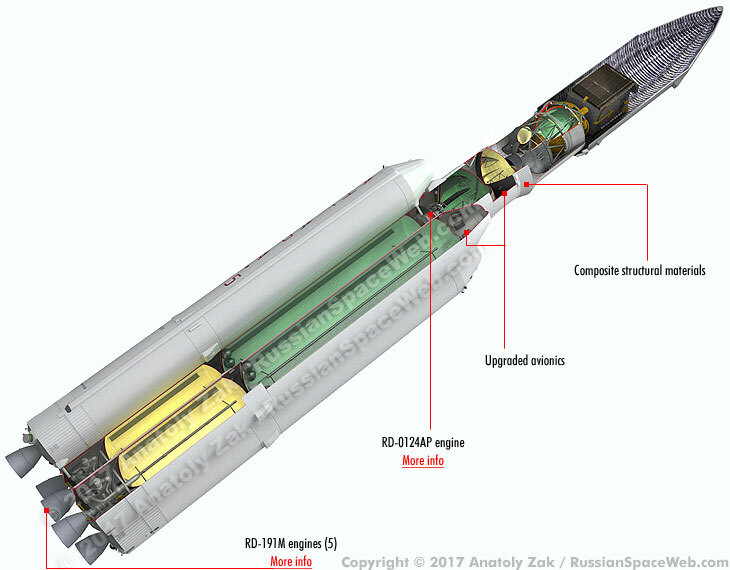 The public pronouncements about the Angara-5M variant coincided with the decision of the Russian government to fund the development of the new medium-class rocket, which could also serve as a basis for a five-booster super-heavy rocket. Theoretically, a three-booster combo of the same new rocket could also form an intermediate vehicle comparable to Angara-5. The development of the new rocket family was expected to be delegated to RKTs Progress based in the city of Samara, the main competitor of GKNPTs Khrunichev within the Russian rocket industry. As a result, the Angara family faced the potential prospect of becoming obsolete even before it had a chance to enter service. Not surprisingly, the development of the Angara-5M variant would be critical for the competition at home and abroad. Much for the Angara-5M success would depend on the commitment of the Russian government to building a new launch pad for Angara-5 in Vostochny, because its existing launch facility at the military launch base in Plesetsk was located too far to the north for cost-effective missions to the geostationary orbit. That was the main reason, Roskosmos had no intention launching commercial payloads on the Angara-5 from Plesetsk and, instead, planned to ship the first 5M variant directly to Vostochny. However, as of the middle of 2017, Roskosmos was yet to begin the development of the new launch facility or even choose a team of contractors for this costly project in Vostochny. Moreover, at the time of the Angara-5M announcement, the second launch of Angara-5 had apparently slipped to the end of 2018 at the earliest. 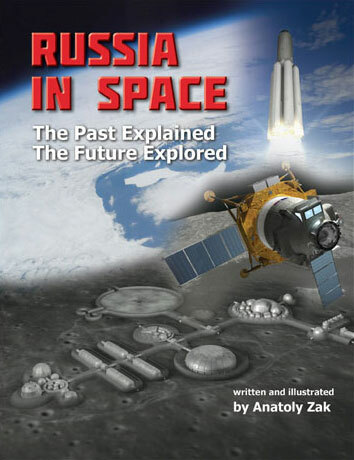 According to an article by the former Designer General at GKNPTs Khrunichev Aleksandr Medvedev published in the Kosmonavtika i Raketstroenie magazine in 2018, the first launch of Angara-5M rocket from Vostochny was expected in 2025. According to the publication, more advanced manufacturing methods could help reduce the cost of Angara-5M vehicle by approximately 20 percent compared to the price tag of its experimental predecessors. 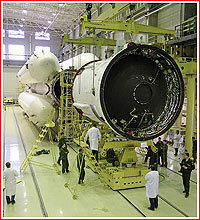 Final integration of the Angara-5 rocket in Plesetsk.